Welcome to Welly-moot - the official blog of the Wellington Tolkien Smial. There are now so many events around the release of the second installment of The Hobbit trilogy that I get to use the word "plethora" in a sentence! Middle-earth News has a good premiere roundup as well. URL for the livestream is on the official Hobbit Movie Facebook page. Check time in your own country here. As of right now (9:00pm, 28/Nov), there are still tickets available for this. Heard this one on the grapevine. I don't know anything official about this, but I'm really pleased to see that the actual people who made the movie get to see it nice and early too. As far as I know it's invite only, and crew only as well. Tickets are sold out, but the details are here. This is the first "proper" public screening of The Hobbit, and will mark the start of the Box Office (I think). Due to the fortunate layout of the International Date Line, New Zealand STILL gets to see this before anyone else. As far as I can tell there's satill tickets available for this one as well. Check the Embassy website for more details. Apart from this plethora(*) of special screenings, I know there's also a large number of Laketown Extras attending one of the sessions on December the 14th, and will have a communal picnic somewhere the next day (15th). Don't know when, don't know where. I'm not invited (though Alex (my wife) is, but she's not telling me). If anything changes I'll keep this page updated, so keep checking back for more info! This page is published on the welly-moot blog, and if you're reading this on facebook, google+, RSS, or twitter, or even via email, you may be missing the links. Check www.welly-moot for more details. That's always the source. (*) you thought I'd forgotten. Billy Boyd and Dominic Monaghan are in Wellington they were just seen today buying tickets at Reading Cinemas?? Ah, I'd heard they were in town. Apparently there was a party at the in Cuba Mall over the weekend. I understand Dominic is doing an episode of his TV show "Wild Things", and this one's set in NZ, and he got his old buddy Billy along for an episode. Geek out with pride! 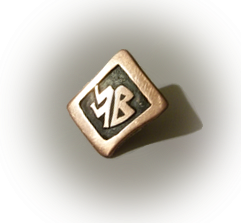 An exclusive Welly-moot badge, designed and created by independant jeweller Annabel Graham, renowned at Weta for previous commissions. (c) 2012-2018, Jack Machiela. All content of this blog belongs to the Welly-moot Smial unless otherwise noted. Permission to copy anything is granted only in writing. In other words, mail me before you copy anything. Yes, that's you, old-world journalists!